(Newser) – The legend of Sdech Kan says the 16th century Cambodian ruler controlled dragons, walked on water, and shot four arrows simultaneously, among other tall tales. 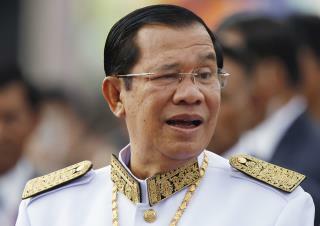 Five-hundred years later, the New York Times reports Cambodia's current ruler—Prime Minister Hun Sen—may see more than a little of himself in Kan. "My understanding, based on my research, is that he thinks he is Sdech Kan," says a monk at a pagoda near Kan's historic capital. The monk isn't the only one who thinks Hun Sen believes he's Kan reincarnated, and a Cambodian historian says that's likely bad news for any vestiges of democracy left in the country. Trump and Bibi are the two most sane and sober national leaders out there, but not appeasers. So the US isn't the only country with a leader suffering from Dementia or Megalomania. It looks like he's drunk.